It's no secret that I'm a big foodie. I love to cook....and I love to eat. Here's the thing....I can't eat what I want to all the time, because I also like to fit in my clothes! So, I've been on a mission since the fall to drop some weight. I'm a huge fan of Weight Watchers and always turn back to the program when I need to drop a few pounds. Which means my grocery shopping frequently looks like this. My method for following the plan is to have fruit for breakfast, a light lunch, and save the majority of my points for the evening, so I can enjoy a nice dinner and a cocktail. That's what I love about Weight Watchers, it's so flexible! I still enjoy so many of my favorite foods, I just choose where and when I want to 'spend' my points! Well, even though I'm delighted to be just about at my goal weight, I still have cravings for some of the foods I like to indulge in. Like cheese. Oh my gosh, I love cheese so much. But I've been staying away from it, since it's super high in points. And I haven't figured out how to change that, or how not to eat an entire block of cheese, so I tend to just stay away from it. But some of my favorite indulgences can be reinvented so they aren't as high in calories and fat. That's where my new toy comes into play. Yup, that's right - Mountain Mama got another new kitchen toy! 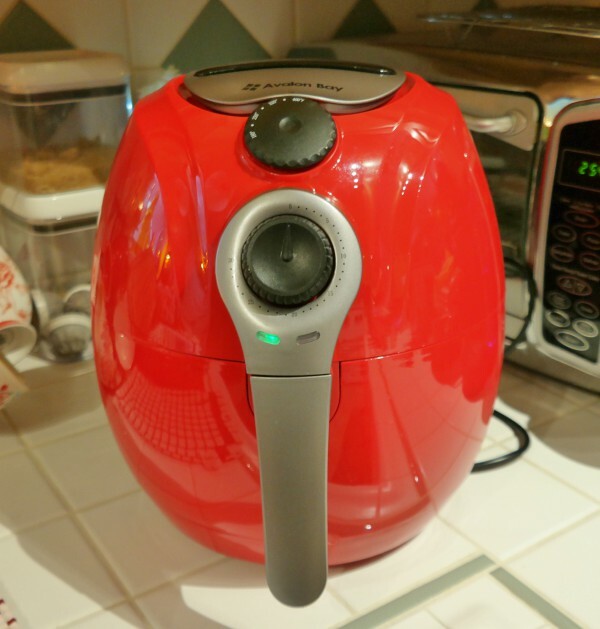 Say hello to Big Red - my new and oh-so-pretty Avalon Bay Air Fryer! Oh boy, I am so excited to experiment with this baby!! I've been researching Air Fryers for a while, and finally pulled the trigger on buying one. And I knew what was going to be first on the list of experiments. Oh yeah, I love me some good old sloppy Buffalo Wings! But I don't love the fact that they are deep fried. No thank you! That's where this baby comes into play. Just look at all that golden deliciousness right there - and not a drop of oil was needed! 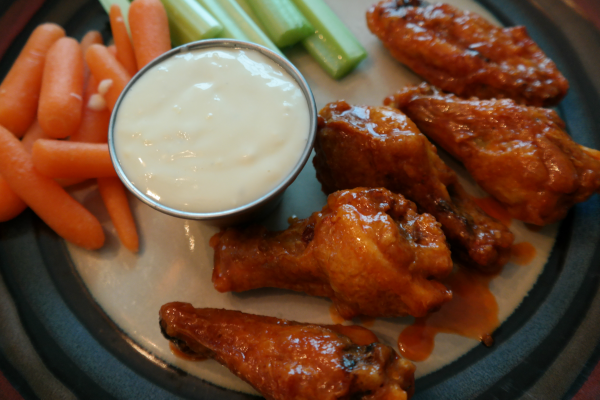 The air fryer circulates hot air at the temperature you set it to, you take the basket out and toss the wings every now and again so that they brown evenly, and that's it. Nothing else to do! Easy peasy! 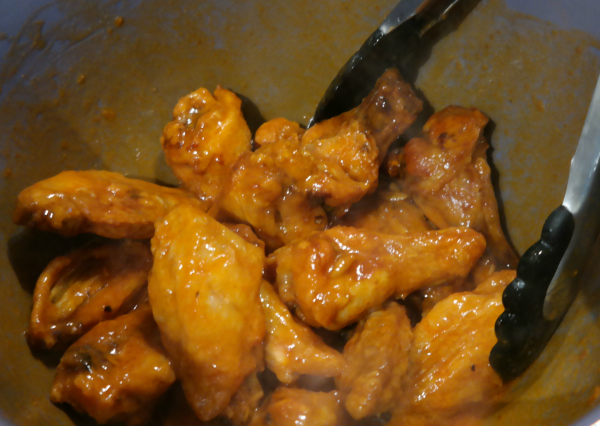 I cooked these a bit longer than the directions indicated, because I like my wings crispy. 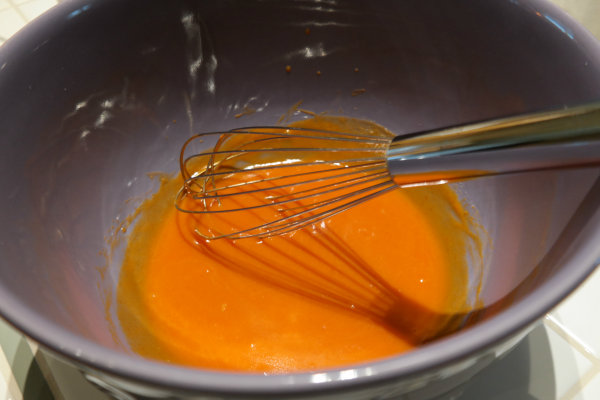 I prepared the sauce while the wings were cooking using the classic recipe of butter and hot sauce. Next time I'll go lighter on the butter, heavier on the hot sauce. I might even experiment with light butter and see how that tastes. When the wings were done to my liking, a quick toss in the sauce, and they were good to go. The aroma was heavenly, I was so excited to try these out! Just look at that! Restaurant quality Buffalo Wings right in my own little cozy kitchen! This was dinner, and I was quite content. These will have to be on the agenda frequently, and I'm going to sample different recipes to see how I can lighten them up even more. Plus I have plans for French Fries, Sweet Potato Fries, Cauliflower Wings, Fried Ravioli, and who knows what else! There's a cookbook on the way from Amazon and I can't wait to get my hands on it. Meanwhile, this is what it looks like on the mountain top these days. 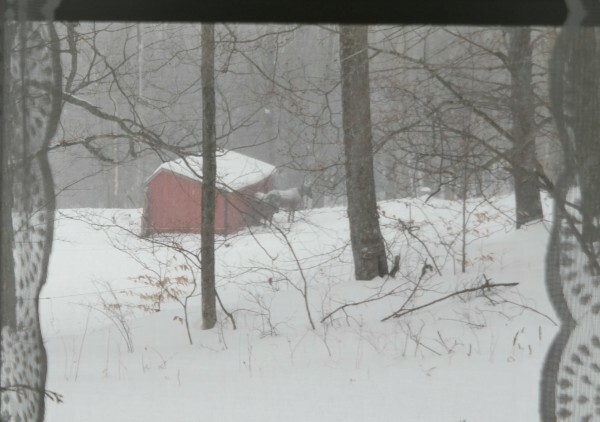 Actually it's even worse than that, since another foot of snow fell on Sunday. Yup. It's gorgeous out there, for sure. 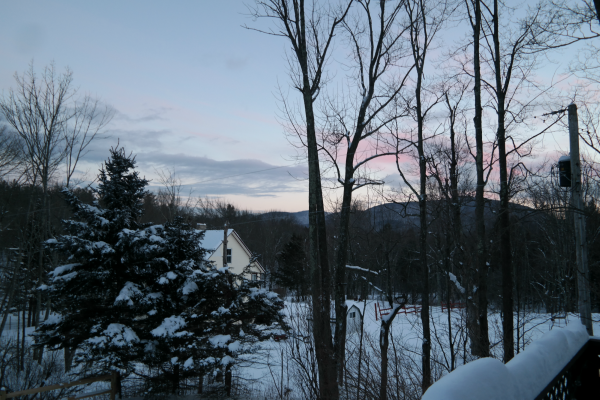 Cold, but so very beautiful. I always wonder why the horses stand at the back of their little barn during a storm - wouldn't it make more sense to be inside? Perhaps it shields them from the wind. I keep all the feeders full for the poor little birds and squirrels. There's a little red squirrel that has decided to shack up in my garage this winter....he's going to have to be relocated when the weather warms up a bit. I hate to kick him out now when it's so very cold out there. Good thing the garage is not attached to the house or I'd be freaking out right about now. Meanwhile, back inside, who's more spoiled than the little Monkey? 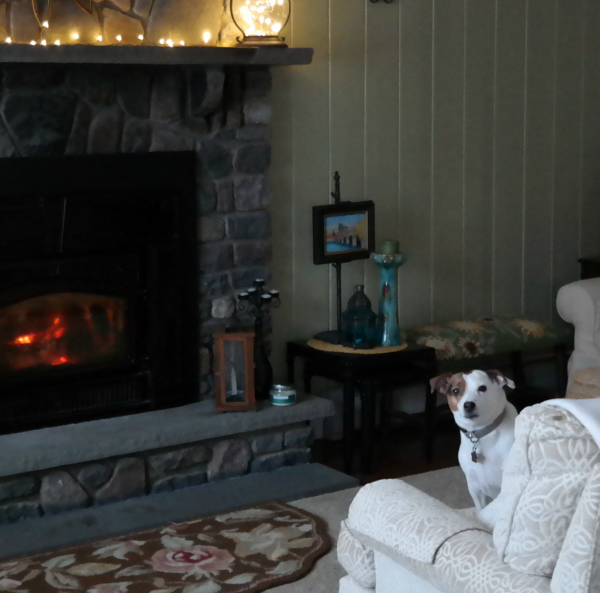 She spends most of her time in the chair right across from the fire. What a little punk she is, look at that cheeky little cute face! 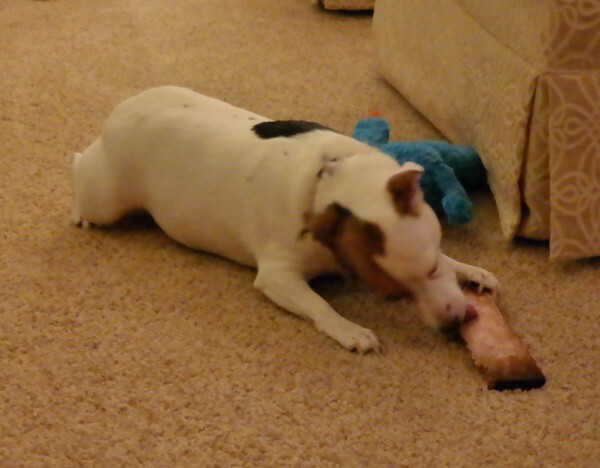 We came home from a nice restaurant the other night with a bone for my old girl, Lily. Guess who stole it within seconds. Okay, first of all, when you said "new toy" a fryer wasn't exactly what I had in mind...LOL AND you've made me want wings for dinner tonight!!! LOL Girl, I love some wings also, but you are so right, they are NOT conducive to weight loss! I try to save them for my "cheat" days, but now it looks like I won't have to. So you really like the fryer? The hubster and I have been contemplating purchasing one so we can enjoy some of the "bad" foods in a healthy way! May be checking this one out! Love and hugs!! YUM!!! Skinnytaste is a great website and they have awesome recipes! I will keep you posted on what we end up getting..I'm inspired! :-) Love and hugs to you!! I've never heard of that "new toy" of yours. But I'm sure you'll have many tasty meals with it. You better believe it, I have so many things planned, Brenda! Ive been looking at those air fryers but havent really investigated one yet. Im gonna goole it right now. Those wings have me sold. Good luck on your weight loss.!! Thanks, Lisa - I'm nearly there, just .6 from my goal....but might keep going since it's really so simple! 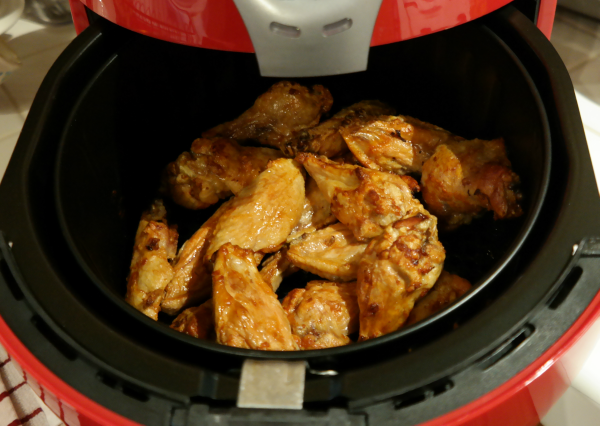 The wings were AMAZING - I am seriously loving my new air fryer! Pretty fluffy snow! Happy valentines day! And happy Valentine's day to you as well - hope it's special, like you! I'm considering another experiment this evening, Diana, but so far I'm super impressed with my air fryer! We've got some warmer temps coming this weekend, Susie, and I'm hoping some of the snow melts off my deck - it worries me having all that extra weight on there! Lucky you! Although last year we had such a mild winter, practically no snow, and then a heavy frost once everything had already budded. It really did a job on some of our crops, like apples! Plus our reservoirs and wells were drying up - not good, and this year should really help in that regard. I've never heard of this gadget but want to know more. French fries? That's my weakness, homemade ones. I wonder if fried beer batter shrimp works in it? Seeing your mountain top, I immediately started hearing Loretta Lynn's lyrics, do you know them? High on a mountain top." Now does this ever remind me of you! Even if you might have a NY accent--I don't know for sure--and not a Kentucky/Tennessee one, you're both mountain top girls! I love Loretta Lynn - Coal Miner's Daughter is one of my all time favorite movies!! I may experiment with FF tonight, stay tuned on that! I would definitely think beer battered shrimp would work also, and I'm guessing coconut shrimp also. Something else on my agenda is good old fashioned buttermilk fried chicken - mmmmmmmm! That's so cute, I love shops like that!! I'll be trying out French fries soon, I'll have to report back to all of you as I do! I love Weight Watchers!! I don't feel one bit deprived (except for the cheese....) and the weight comes off! I will definitely keep you all posted on recipes, the air fryer is definitely all the rage right now! I have long been curious about these air fryers, but never knew anyone who had one. As much as I love fried foods, I really don't like the oil, or the mess. This seems like a nice alternative. Great post! I'd love to see what you would make in the air fryer, Pattie - your recipes are so wonderful! I need some motivation!!! I have gained a lot of weight over this past year. I had hush puppies cooked in an air fryer at Christmas... OMG!! Thanks for reminding me I want to purchase one. You're welcome!! I'm telling you, Weight Watchers is amazing. I don't go to meetings, I do it all online....and I still enjoy my cocktails and chocolate and real food! They have a great feature now which is called "connect" and basically a social media platform where people share successes, challenges, recipes, etc. I love the before and after photos, it seriously motivates me like crazy. I'll spend time on Connect a few times a day, just browsing through, and it keeps me going! Good luck, my friend! Your new toy is new to me! Wish I knew about it before my son and I bought my husband a real fryer for Christmas. After the first time he used it in the kitchen I insist it gets used on the side porch which is basically outside. It stunk up the whole house with fried oil smell and I am sure oil splatters. I will have to investigate the air fryer for me! Ha ha, that would be funny, you could compare recipes! I'm guessing you might just switch him over to your side of the fence! You are so cute - I know how you love your kitchen gadgets! Have fun with your new toy. Two of my friends and my sister and BIL are all on WW and they've all lost a lot of weight. I was on the program a couple of times way in the past and I lost a lot of weight both times, too. It's a great program because you really learn how to control your portions and you don't have to buy any "special" food - which is unrealistic. They also emphasize exercise and drinking lots of water - win-win. So true, Melanie - they emphasize a lifestyle change, not buying special meals or shakes! And since I like to eat 'real' food and not processed, Weight Watchers is the way to go! Same here, Karen - when I was younger I could have anything I wanted....now, on the brink of menopause....nope!! My sister was talking about an air fryer at Christmas, but since she didn't know anyone who had one she didn't go for it. I am going to have to send her a link to your blog so she can see that little gem in action. She has a house full of people who would love those wings. PS- Cheese is my weakness. I had never heard of an air fryer before ! Sounds wonderful and the food looks delicious! 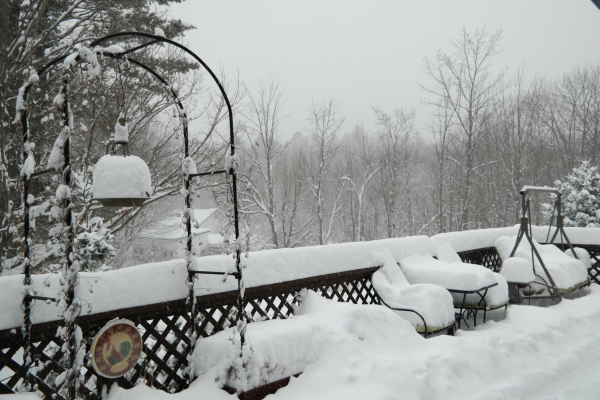 You have gotten your share of snow this month that is for sure! I love watching all the squirrels outside but I have to say that little red guy scared the daylights out of me the first few times I saw him in my garage!! 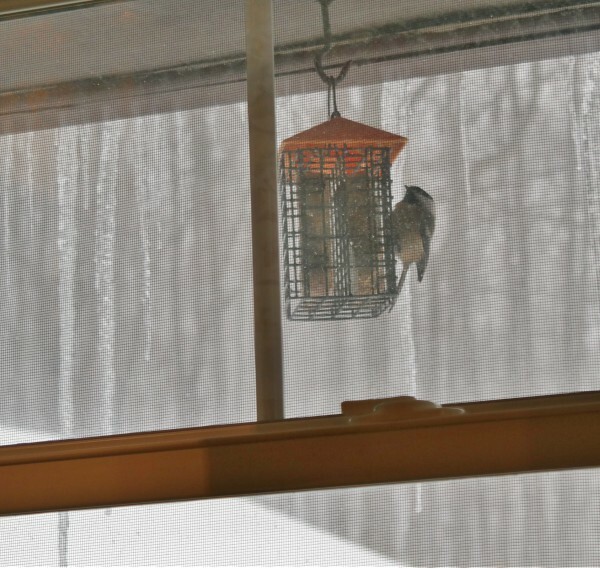 Now I'm used to him popping his head out of the eaves....but he's still going to have to be trapped and relocated come spring! OMG! We want an air fryer i think ill get one for james for our anniversary :) I love this post, you were right! Ha ha, I knew you would, Ellen!! :) Go for it, you'll love it! There are not a ton of recipes online so I also ordered a cookbook from Amazon - just got it and can't wait to settle in with it tonight, I'm going to try a BUNCH of recipes! That snow!! I can't even imagine how cold it must be. I've stopped by a couple times and wanted you to know I think your blog site is lovely. I've enjoyed several of your post and look forward to future visits. In this post you mentioned not knowing why your horses stand behind the shed instead of going inside the shed when it's windy out. We live on the Montana prairie where the winter winds are often fierce. During wind storms horses always stand with their backsides to the wind. If they can get behind some sort of wind break they will do so but still keep their backside toward the wind. Horses have more muscle mass in their hind quarters which acts as an insulator. This behavior is instinctual. Hi Mrs. B - thank you so much for clarifying that, I was not aware of that! How exciting living on the Montana prairie, I'm sure you see lots of wild critters! !